Almost exactly a year ago I wrote about applying Fitts’ Law to commonly used buttons. Fitts’ Law is pretty well known among user experience professionals and front-end developers as it can be used to make commonly accessed user interface elements much easier to target. Hick’s law is probably less known, but its effectiveness is just as great. Hick’s law “describes the time it takes for a person to make a decision as a result of the possible choices they have.” This law can be applied to the number of options for a question on a form, the number of dishes offered on a restaurant menu, as well as the number of menu items on a context menu. In the case of Firefox’ context menus, we were able to remove a very seldomly used menuitem (“Send Link…”), and combine the “Reload” and “Stop” buttons. Our new heatmap data showed us that only 0.89% of users clicked on the “Send Link…” menuitem. This is not really a surprise, given that the location for the majority of webpages can be found by looking at the location bar. This is in contrast with “Send Image…” which was used by 3.34% of users. “Send Image…” likely has higher usage because the majority of image URLs are not available in the primary UI. Combining “Reload” and “Stop” gives us another nice win because the two states are mutually exclusive and the combination reflects the default state of the two actions in our location bar. Making this change led to discussions about removing the “Forward” menuitem when it is disabled, similar to how we remove the Forward button in the navigation toolbar when it is disabled. While removing the “Forward” menuitem would align with internal consistency, it would also make the remaining menuitems more ambiguous (“Back” and “Reload”). The disappearance of the Forward button in the navigation toolbar does not make the Back button ambiguous. The back button is visually connected to the location bar (signifying a relationship between the two items), and the arrow describes moving backwards. If the context menu only contained “Back” and “Reload”, or potentially “Back” and “Stop”, then there is a much greater chance of confusion as to what “Back” really does. In other words, the presence of “Forward” helps to provide a navigational context for the other menuitems in their group. Another context menu option I feel irrelevant is “Set as Desktop Background”. The way the desktop has changed over years, the Gnome Shell, Unity, Windows 8 Metro UI, I doubt this option is relevant anymore. The philosophy of having different random images on the web as a background is strongly discouraged. Most of the images on the web these days are not wallpapers anyway, and I dont see myself setting memes as desktop background. In anycase, images with lower res, which are all over web pages, should not qualify for desktop wallpaper, as they are likely to be Logos, Display Pictures, Icons or symbols. It would be good to clean this feature up too. When, I copy a text, and go to URL bar, the context menu shows “Paste”, and “Paste and Go” on two lines, could these be combined on one line separated by a | pipe ? As they are nearly the same thing. “Paste and Go” looks unorthodox. Probably, replacing text by symbol again might help with the regular paste symbol, and Paste symbol + go symbol, or maybe Paste in text with a go symbol next to it. So if user clicks paste, it pastes, while if he clicks the go symbol next to paste, it would paste and go. Similarly with Paste and search, i feel this might help. About the decision to remove “Send link”, I think it is a very good decision. However, I think “Share link” may be a much more used feature. I have read about Firefox working on a Social API for this. This would be a good idea, as it would provide a neat UI to share across various social platforms. The Send link could perhaps be reinvented there as an option to share via email. Also consistently send image could be moved over there. 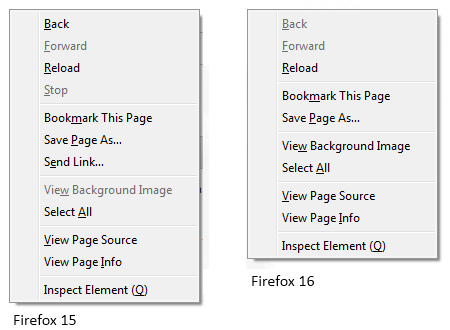 I have posted these few things which I always had in my mind about Firefox UI. How many people use “select all” from the context menu? In what context? I’d take offence to having Select All removed from the context menu entirely (It’s a convenience analogous to the “Paste and Go” option in the address bar context menu), but I’d applaud following Chrome’s lead in making it only appear in editable regions like form widgets. « What is it like to work as an engineer at Mozilla? You are currently reading Applying Hick’s Law to the Firefox context menus at JAWS.